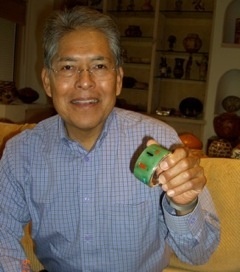 One of my longest standing relationships as an American Indian art dealer is with contemporary jeweler Richard Chavez. Richard Chavez, from San Felipe Pueblo, creates pieces of jewelry that really are restrained compositions of modern art, perfectly attuned to form and color. 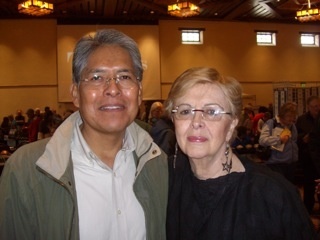 I first saw Richard Chavez’s work in 1976 at an artist cooperative at San Juan Pueblo. I was so struck by his innovative jewelry that I went to my first Santa Fe Indian Market that summer with the sole purpose of finding Richard. When I found him at market (he was participating in his first one that year too), I asked him to do a show in Chicago at my newly opened Indian Tree Gallery, and he agreed. That November, Richard Chavez became the 2nd American Indian artist to do a show at my gallery, the first of several shows that Richard and I opened in Chicago. Richard Chavez’s jewelry is minimalist in form and quite high-style all the while infused with technical perfection. Richard’s background in architecture undoubtedly influences his jewelry. Only 19 hours short of an architecture degree from the University of New Mexico, Richard Chavez worked as a draftsman for architect Harvey Hoshour, who studied under one of the masters of Modern Architecture Mies van der Rohe. In the Mies van der Rohe style, Richard Chavez developed a less-is-more approach along with a restraint that he carries into his jewelry design. Knowing when to stop is of great importance in the contemporary jewelry world, and Richard Chavez has mastered this ability. Along with his impeccable sense of restrained design, Richard Chavez executes his designs flawlessly. Richard is actually unsurpassed in his ability to cut and polish stones. From 14kt clasps to intricate, puzzle-like inlay, Richard creates every element of his jewelry by hand. Ever the perfectionist, he is so skilled that often it is difficult to even see the seams in Richard’s inlay work. Look at this bracelet of Edwards black jade – it looks almost like one piece of black jade rather than many. For someone so good at what he does, Richard Chavez is very distinguished, quiet and reserved. He doesn’t self-promote, and his humility prevents him from talking about how good he is. But he IS that good. I sincerely believe that Richard Chavez’ work will be very important in the future when looking back at the development of contemporary American Indian jewelry. He is certainly a master, and he is the contemporary jeweler to collect if you want heirlooms in the making.